Q1. Your dog’s pet name. Q2. Your dog’s kennel name. Q5. Age now or at date of death. Q6. 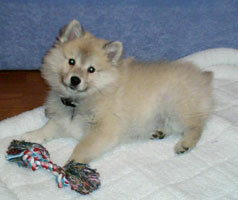 Why did you choose to get a Finnish Lapphund? We wanted a family pet who needed lots of walks and love. Their temperament appeals to our family – fun, intelligent and devoted. Q7. What were the most challenging aspects of training your dog? Their intelligence meant that Oskar learnt quickly good and bad habits. Recall was rather challenging and requires continual training to ensure he knows who is boss. Q8. What could you train them to be really good at? Chasing squirrels! But joking aside I think agility would be a forte. Q9. How readily were they trained? Very easily trained if done correctly. Oskar especially loves doing tricks. Q10. What motivates your dog in training? Food especially Puff Jerky and sausages followed by a game. Q11. What motivates you in training? The reward of seeing my dog achieve and how happy he is when he gets lots of attention. Training equals attention and a game to follow. Q12. What type of food does your dog eat daily? Eg wet or dry. Q13. How many grammes of food would they generally eat everyday? Q14. Do they “scoff” or “pick-at” their food?! Q15. Have they had weight problems? No weight problem although he is heavier now than in the summer but that is probably his coat. Q16. Have they had any health problems? Minor eye infection due to the constant rummaging in the undergrowth treated easily with saline and cotton wool. Q17. If your dog is deceased, what was the cause of their death? Q18. How would you describe their health in general? Q19. How do they get on with family, children, friends and strangers? Oskar loves people. Exceptional with small babies although never left unattended. He sees children as fun and someone who will always be up for a game. Keen to meet and greet any body into our home or out on a walk. He is protective of humans. Q20. How do they get on with other dogs in general? Possibly due to being attacked but more likely because I was attacked by a dog, he has had some trouble with male dogs by showing aggression and having a few scraps especially when he first went into adolescence. Intensive training instructed by a professional trainer has turned his aggression around, although he still has the odd scrap occasionally – usually with another dog who has a strong temperament like Oskar. He has a lot of dog friends who he plays with regularly mostly female but also some males. Q21. How do they get on with other Finnish Lapphunds? Oskar is not a lover of other Male Lapphunds and tends to growl if in his territory but out on a walk he is fine and will run and play. Q22. What challenges do they present on a walk e.g. chasing deer, squirrel hunting, swimming, poor recall, scared to leave your side?! Selectively deaf when he sees squirrels or rabbits and won’t come back. Would love to herd the cattle on the hill and did in fact try. Has always been on a lead around sheep. Not interested in horses though but a good dollop of horse manure or a cowpat make a great place to roll!! As for water – forget it a paddle is all he will do! Recall is ongoing training and if you lapse for a while he will take advantage. Q23. Describe your dog’s personality using five adjectives. Lively, funny, catlike, strongwilled and loving. Q24. 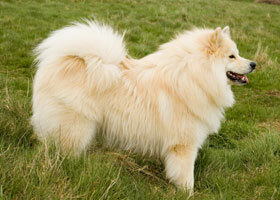 Have you owned or been very familiar with other dog breeds? If yes, which ones? No Oskar is our first dog. Q25. 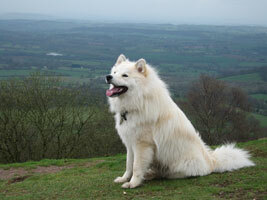 How would you say the Finnish Lapphund compares to these breeds?